I’m used to talking about Ushahidi, and as all of you guys who frequently talk about your product or company know: it gets old spouting off the same old stuff over and over again. That’s why I’m excited about today and for being invited to this excellent conference, since I’ll be telling the backstory, the quirks and funny bits that got us to this point and made our Ushahidi culture what it is today. This is my story of Ushahidi – Of a small organization that dislikes hierarchy and being told what we can’t do. One that questions everything, embraces innovative thinking, takes risks boldly, and sometimes learns the hard way that we’re human after all. In January 2008 I spent a week watching news reports roll in from Kenya, frustrated. Frustrated because I had said for years that “technology helps us overcome inefficiencies”. Wasn’t the madness of Kenya, in it’s post-election violence throws, it’s lack of media coverage, and lack of real information just this? Why was I unable to do anything? It turned out that I needed an idea, and for once I couldn’t come up with one on my own. That seed of an idea that grew into what you see today came from a simple bullet point by my friend and fellow blogger Ory Okolloh, asking if we could map reports of violence around the country. Thus Ushahidi was born. I’m going to walk you through three defining moments for our organization, and our platform, not all of them pretty, but which make us who we are. 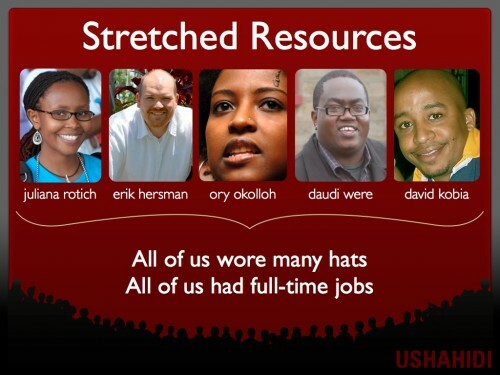 Others – a various cast of tech and non-tech people swarmed around the first Ushahidi deployment in Kenya, helping with small tasks and then disappearing. Most of us were self-employed, running our own businesses or consulting, and didn’t like working for big companies. The only common denominators that we shared was our love of our home; Kenya, and the ability to blog. Thus, we felt we were the best placed to create an African open source platform for crowdsourcing information, our tech gift to the rest of the world. We didn’t think of that at all actually. Instead we were madly Skyping, emailing, wireframing and coding over a 3 day period to get something up as quickly as possible. If it wasn’t absolutely necessary, throw it out. No one has a short code for us yet? Screw it, it’s not worth waiting, we’ll get one eventually. Money, what’s that for? 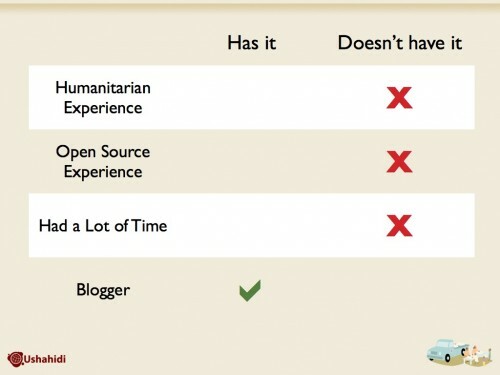 Media budgets are overrated, we’ll blog it. We don’t have a logo. Oh well… Launch already! How our team came together, the way we made those initial decisions and how we interacted and leaned on what would become our community was defining. It still colors how we operate, our organizational communications and our community focus. This taught us to keep a shallow and wide decision-making structure so that everyone had access to all the information about ops or platform that they desired. Anyone was empowered to make decisions, since thy understood the macro-game. Release code early, it’s better to have it out and being tested and worked on in the real world, than hidden away in a sandbox somewhere. 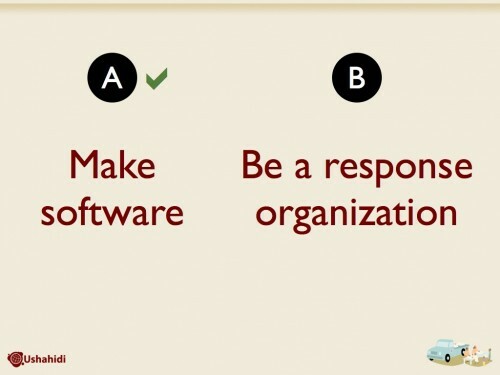 If you want it done, build it yourself, don’t put it off onto another team member. No money, no worries. Build good stuff and good stuff happens, money follows. No background in open source projects meant that we had little experience in how to engage programmers, designers and the help needed to get things moved from that initial .NET build into an open source language. David and I were trying to decide what language to write this in, and we ended up picking PHP over Python since we thought more African programmers would be proficient in it. David wasn’t a PHP guy (yet), so the early helpers, the volunteers like Jason Mule, Henry Addo and Chris Blow were a huge help in making the decision to go with the Kohana framework and a myriad of other decisions. We were very excited, after all, wasn’t this the platform that would save the world? And we were ready to show the world just how it could be done. Gamely mounting our white steeds we charged into a deployment of Ushahidi in the troubled North Kivu region of the DR Congo. Echoes of that failure splatting against the ground remind us still, today, of the complexities of the space we build software in. We learned from those lessons though, and Ory wrote a good blog post making sure that it was shared within and without. Technology is only 10% of the solution needed. The rest is administration and messaging. 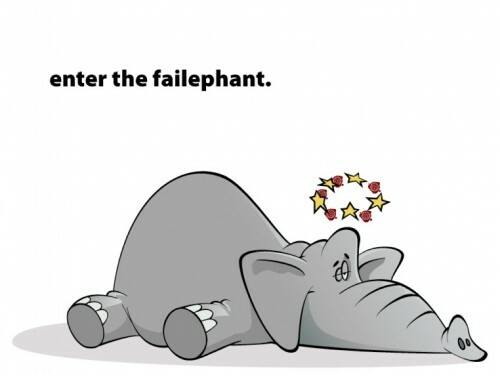 Own your failures publicly, learn from them. Only a few months later, after the DRC debacle, we were rested and ready to fail again. Al Jazeera had used the alpha version of the Ushahidi platform in Gaza, a group of organizations and individuals were deploying it to monitor the worlds biggest elections in Indian, and we had a number of groups in East Africa testing it out. Our model was that we had a small team at Ushahidi whose job was to come up with and guide the core architecture of the platform. Volunteers also worked on core, but were also encouraged to extend the platform in their own ways. It was working very well, and still does. We were ready to release the code publicly. Preperations were made, blog posts were written, tweets were tweeted – and we got lambasted by one of the guys we respect a great deal in the open source community. Rabble called us out on all the things we did wong. Our team went to work, madly working over the next 12 hours to get our stuff straightened out. 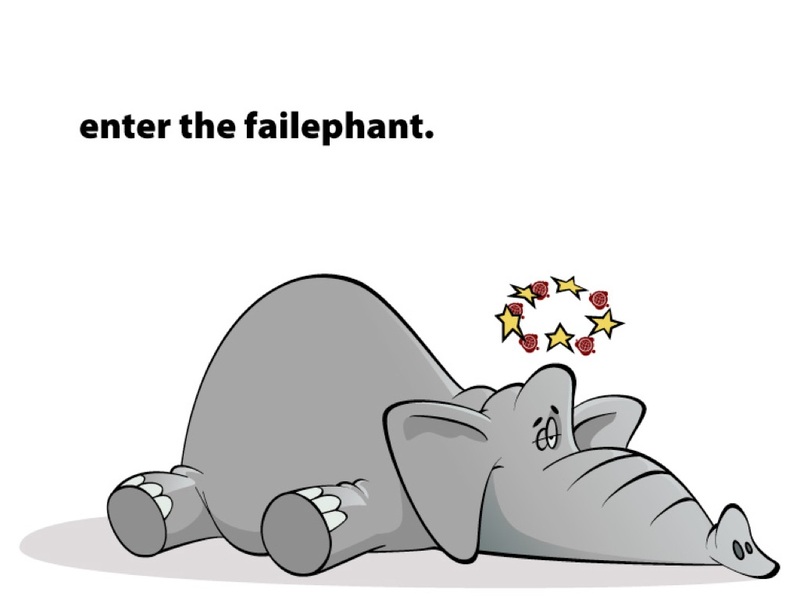 Finally I wrote another blog post, introducing our failephant mascot and apologizing for our ignorance and missteps. Again, own your failures. Fix things that are wrong. Finally, I’ll end with this. We’ve learned that technology does overcome inefficiencies, but that it still takes people to make it happen. We’ve learned that more people need to buck the status quo, that questioning everything makes us better. We’ve learned that Africans can build world-class software, and to expect nothing less. A few more conferences to add to my earlier list of events going on around the continent, though one is in the US and another is in Europe, and are about Africa. Tech4Africa – The Technology for Africa conference has a group of really interestin speakers from around the web, mobile and ISP space in Africa. A lot of grassroots guys who are actually doing things, intermixed with some international, and well-known, speakers. Int’l Bloggers Roadshow – Still being put together, it sounds like an interesting group of US-based big name bloggers will be heading to South Africa. More by Matthew Buckland. FOSS4G (Free and Open-Source Software for Geospatial) – A meeting of international mapping gurus. Hopefully we can get some major African mapping work started here. Surprising Africa @ Picnic’08 – A one-day program designed to inspire and update the Picnic public – creatives, innovators, trendsetters and technologists – with a range of cross media and culture happenings from various Africa countries. From South African urban identity photography to Ethiopian architecture, to mobile banking to Kenya (online) critical writing, amongst others.